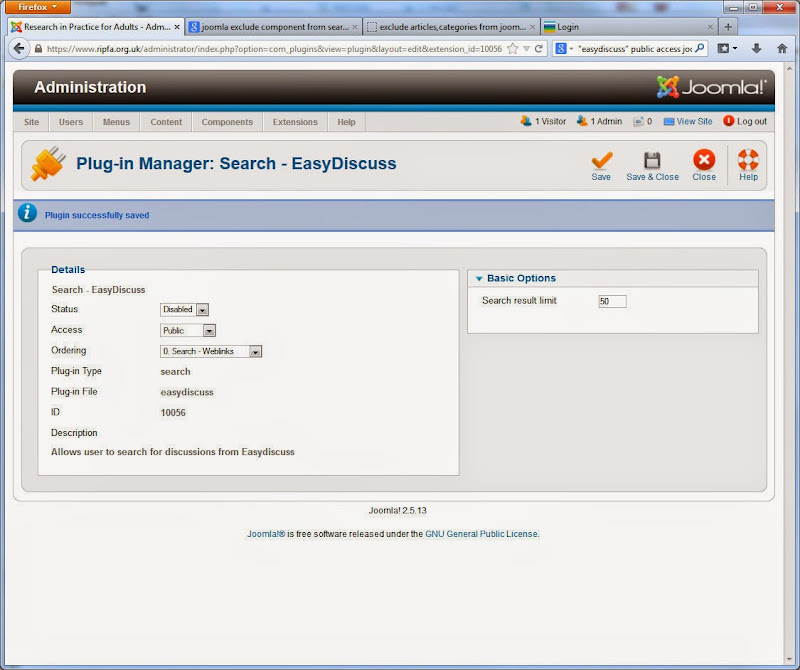 Thinking about the site-wide search, you realise this has nothing to to with the forum extension (EasyDiscuss). We have to modify settings for the core Search plug in to exclude particular items. The good news is sitewide search is so flexible you can choose to include or exclude site items - down to particular articles and categories, or particular extensions if necessary. First you have to find the specific Search core Joomla plug-in. 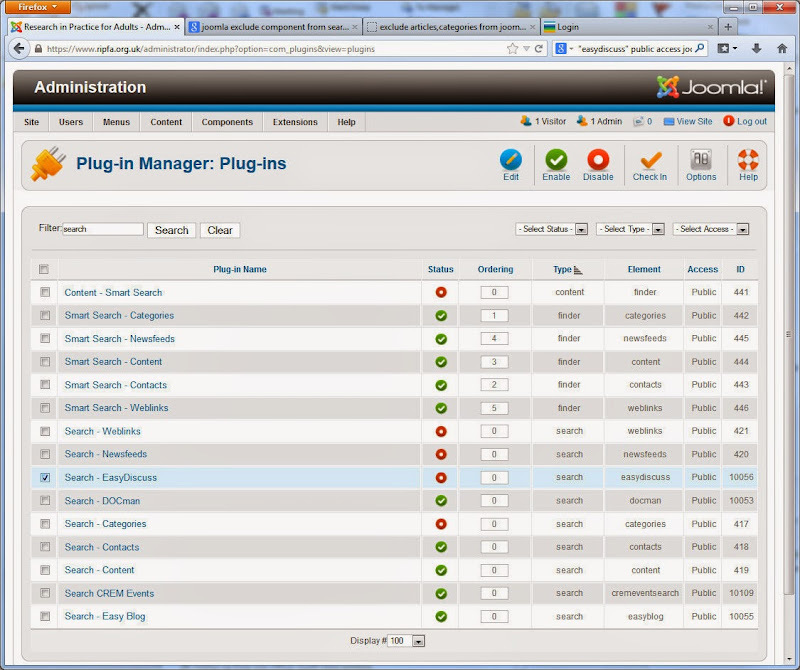 Login as Administrator and go to Extensions, Plug in Manager. With all th core Joomla plugins and the many third-party plugins on the site, it's easier to filter the list, so I search on, err, 'search' to reveal the screenful of search-related plugins. The core Joomla site-wide search is split across a number of plug-in components, all prefixed 'Search', which apply to different types of content - Weblinks, Newsfeed, Content, Categories - including one for EasyDiscuss. Each one opens a further set of controls applying to that item type. I choose Search - Easy Discuss. You will get a set of default options on right side of the plug in - search limit being the most common, but you would also get checkboxes for Articles and Archived Articles, for example if you configure the Article search. In this case I'm looking at effective permissions for searching EasyDiscuss. The first one is a blunt instrument of Enable/Disable. If I disable it, no forum threads will show up for anyone - EasyDiscuss is completely excluded from search. Instead, I have to adjust the permissions, so I change the Access level from Public to Registered. That way, forum threads will only show up in searches by logged-in users. Nice information , waiting for your next article.